The 3rd Korea –Japan Geotechnical Engineering Workshop was held in Ansan, Korea from September 9th to 10th, 2010. 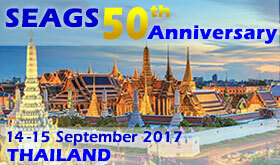 It was organized jointly by Korean Geotechnical Society (KGS) and Japanese Geotechnical Society (JGS). 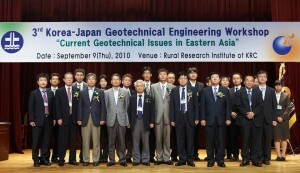 Under the success of previous workshops (the 1st Workshop in Seoul in 1990 and the 2nd Workshop in Tokyo in 2008), the 3rd Korea-Japan Geotechnical Engineering Workshop was held in Ansan, Korea, together with KGS Fall Convention, with the main theme of “Current Geotechnical Issues in Eastern Asia”. A total of 21 papers were attracted from KGS and JGS and the paper presentation was made in four sessions: Site Investigation and Soft Ground, Soil Behavior and Dynamic Response, Underground Structures and Ground Response, and Geo-Environmental Engineering on the first day. A technical site tour was conducted on the second day by visiting the GangChon Bo, Yeoju, one of the sites for “Four River Restoration Project” which is a government priority enterprise for the purpose of preventing floods, securing water resources, and encouraging re-creation of land in Korea. The next workshop is already planned to be held in Kobe, Japan, in July 2011 and both societies wish to continue strengthening the collaborations and friendship between members of the two societies through workshops.